Wikimedia Commons has media related to Heraldic shields by shape. Bouched or bouché side ("German" or "Dutch" style), 15th century. 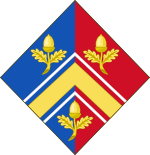 Pippa Middleton's coat of arms (granted 2011), based on those of her father. This lozenge shaped version, supported by a blue ribbon, denotes an unmarried woman. The lozenge shape of quasi-escutcheon is also used for funerary hatchments for both men and women.Pretoria High School for Girls in South Africa is one of the few all-girls schools that was granted permission to use the lozenge as part of its coat of arms. Escutcheons as mobile charges, as borne by the French family of Abbeville. Inescutcheons for style in the arms of the Swedish Collegium of Arms. An escutcheon of pretence, as borne by the French family de Champagne-La Suze. Inherited arms borne en surtout over territorial arms. ^ The origin of the inescutcheon of pretense lies in the armorial representation of territorial property. A man coming into lordship by right of his wife would naturally wish to bear the arms associated with that territory, and so would place them inescutcheon over his own; "and arms exclusively of a territorial character have certainly very frequently been placed 'in pretense'." Fox-Davies (1909), p. 539. It is also worth noting that the arms thus borne in pretense represent arms of assumption, while those on the larger shield represent arms of descent. ^ Especially in continental Europe, sovereigns have long held the custom of bearing their hereditary arms in an inescutcheon en surtout over the territorial arms of their dominions. Fox-Davies (1909), p. 541. This custom, coupled with the frequency of European sovereigns ruling over several armigerous territories, may have given rise to the common European form of "quarterly with a heart". ^ Boutell, Charles (1914). Fox-Davies, A.C. (ed.). Handbook to English Heraldry, The (11th ed.). London: Reeves & Turner. p. 33. ^ Codex Figdor, Tiroler Landesarchiv, Innsbruck (c. 1400). ^ The gap or bouche represents the opening for the lance in specialised jousting shields, attested (in depictions of actual shields) from the mid 14th century, occasional use as a shape of heraldic escutcheons from the mid-15th century (Grazebrook 1890, 31–35). ^ used in the Armorial général de France (1696). The "French" shape of the base is found earlier, in French and English heraldry, from c. 1600 ("Stuart" type). ^ called ecu suisse in some French sources of the 19th century, as this shape was used in coats of arms on some coins of the Swiss mediation period (1803–1815). ^ "Royal wedding: Kate Middleton coat of arms unveiled". BBC News. 19 April 2011. Retrieved 19 April 2011. ^ Bates, Stephen (19 April 2011). "Kate Middleton family gets coat of arms". The Guardian. UK. Retrieved 19 April 2011. ^ Fearn, Jacqueline (1980). Discovering Heraldry. Shire. p. 61. Fox-Davies, Arthur Charles (1909). 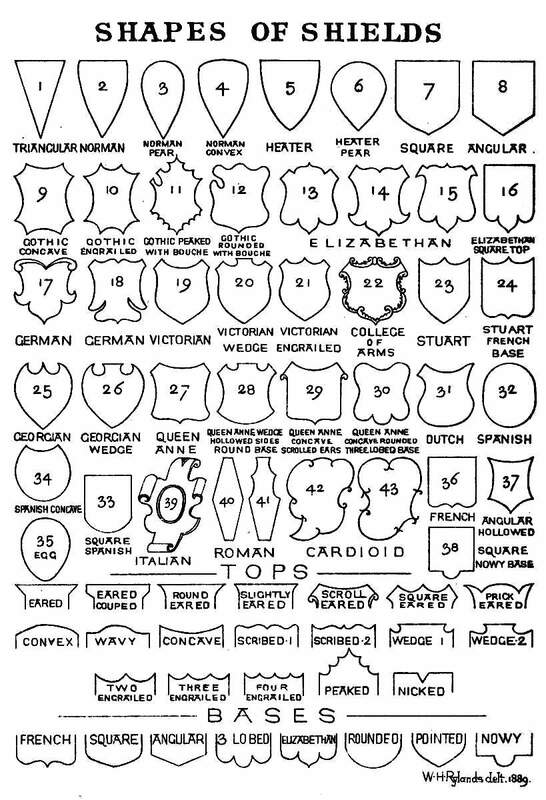 A Complete Guide to Heraldry. New York: Dodge Pub. Co.
Grazebrook, George (1890). The Dates of Variously-shaped Shields With Coincident Dates and Examples.